Victory is sweet, and it tastes like sourdough. After many false starts and several outright failures, I finally succeeded in cultivating a wild-yeast sourdough starter. Here’s the better part: I baked a delicious loaf of bread, leavened by nothing more than my wild-yeast starter! I didn’t even have to cheat and spike it with commercial yeast. As I mentioned in a previous post, using an acidic, sweet liquid (pineapple juice) to hydrate my initial culture proved to be the breakthrough I needed….information I found in Reinhart’s Artisan Breads Every Day. After a little more than two weeks’ tending, which consisted of occasional stirring and less occasional feeding, the initial culture was lively enough to raise a loaf of bread. I built the levain into a dough starter with part white whole wheat flour, aging it a day in the refrigerator to develop the sour flavors. 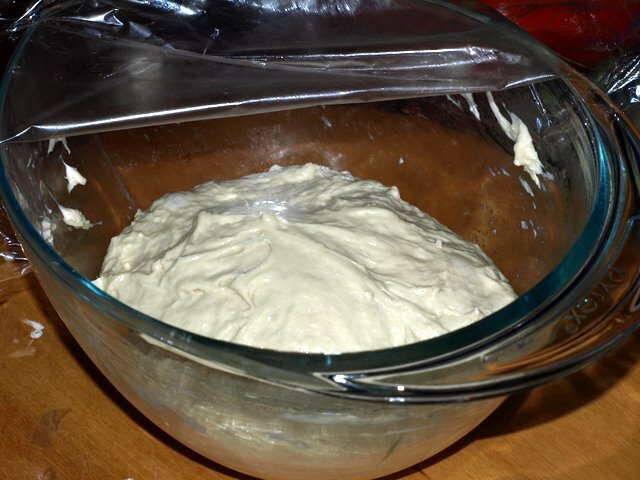 Then I mixed the dough starter into a batch of dough, which also rested in the fridge overnight. Finally, on baking day, I proofed the unshaped dough at 75 degrees for two hours, shaped it into a loaf, and proofed for a final two hours. 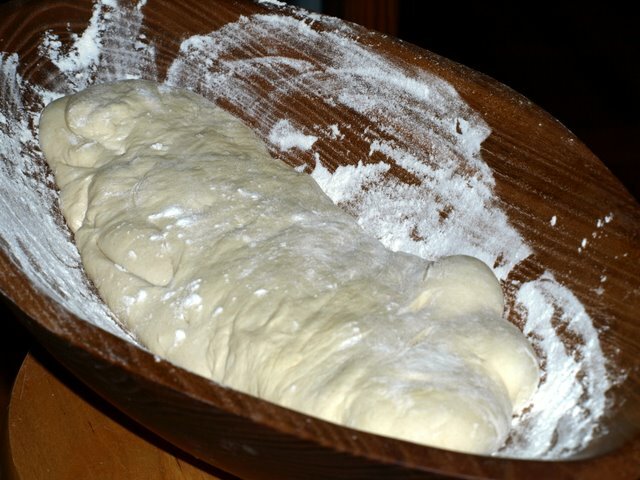 The dough was quite slack, which made me nervous: so I couched it in a well-floured wooden bread bowl. I wondered: would the wild yeast produce any oven spring at all? 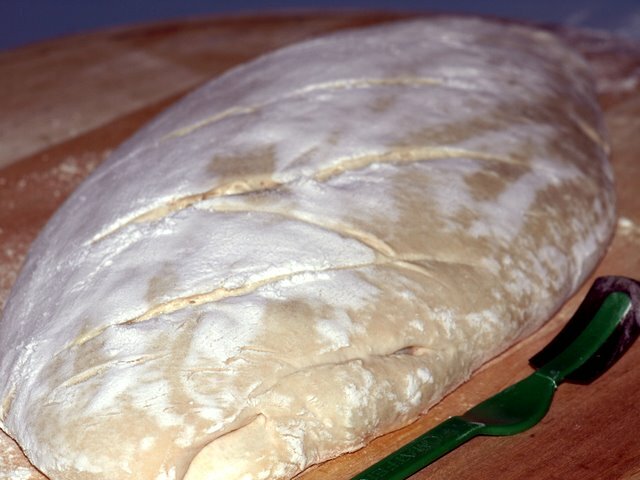 Five or six slashes completed the loaf before it baked for 30 minutes at 450, directly on a baking stone. 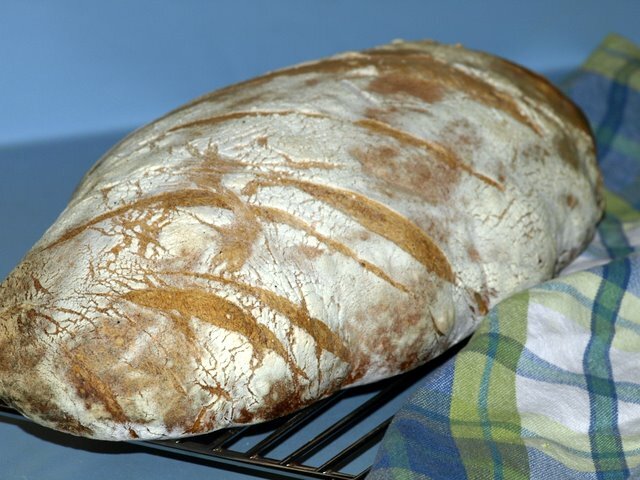 I didn’t need to worry about oven spring–the loaf rose tall and wide, filling out the slashes and splitting open on one end. 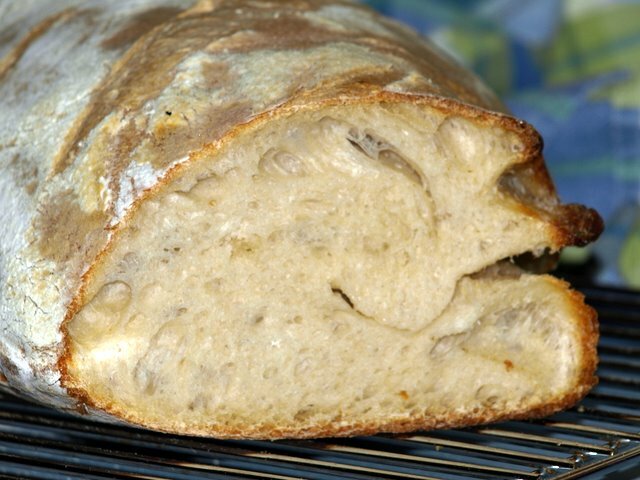 Better than its apperance was the taste: tangy, with an large, irregular crumb and thick, crunchy crust. After all of the failures, success tasted delicious (when spread with a little salted butter). It will be interesting to see how long the loaf keeps without staling. Looks fantastic. I always kill my sourdough starters, so after reading this I’m inspired to try again. Thanks, Loulou….the pineapple juice solved all my problems. Give it a whirl.